Referred to as ‘the last great race on Earth’ the 1,000-mile Iditarod Trail Sled Dog Race runs from Anchorage, in south central Alaska, to Nome on the western coast of the Bering Sea. Tackling the mixed terrain, unpredictable weather and constant sub-zero temperatures, the mushers’ choices on feed and snacks for their dogs are as important and indeed varied as their race strategies and sleep patterns. Sliding across the frozen finish line first in Nome at 3.a.m, with a time of 9 days and 12 hours, Joar’s choices on dog nutrition, and of course racing, were clearly just right, netting him Iditarod victory at the sixth attempt. Feeding his dogs Willy, Suggen, Skorpa, Jompa, Todd and Bia, led by 3-year old Olive and 4-year old Russeren, with the inclusion of QRILL Pet two times a day, morning and night. Keeping them well fed and happy is key to doing well, it’s not rocket science, they are the stars of the show. The fact that we had no issues, no problems, and Olive and the gang were fit, healthy and nearly as happy as me at the finish posing for photos is proof that their nutrition was spot-on. Race-proven by Joar’s beloved pack of huskies, the positive effects QRILL Pet can have on dogs are also well documented in a number of studies, including one revolving around the Iditarod itself. Undertaken prior to a previous edition of the race, the effects of QRILL Pet on the Omega-3 Index, inflammation and muscle damage were investigated in a 5-week study with 32 of the race dogs. Divided into two groups, 16 dogs received a diet with 8% inclusion of QRILL Pet, while 16 dogs received a control diet. Blood samples were taken from all the dogs at the beginning and then at the end of the snowy, windswept 1000 miles/1600 km race. The findings were as remarkable as the stamina of these incredible dogs during the grueling long-distance sled dog race. Dogs in the QRILL Pet group had a significantly higher Omega-3 Index at the start (6.22% vs. 5.05%) and end (6.25% vs. 5.14%) than the dogs in the control group. The study also found that there was 55% less inflammation in dogs with krill inclusion. Indeed, a study we conducted two years ago at 2016 Iditarod race to investigate the effects of krill meal on exercise-induced inflammation and muscle damage on race dogs, showed that 8% inclusion of QRILL Pet significantly increased the amount of omega-3 fatty acids in cell membranes prior to the beginning of the race. We saw that this was associated with lower markers of inflammation and muscle damage at the end. Says Dr. Lena Burri, Director R&D, Animal Nutrition and Health at Aker BioMarine. 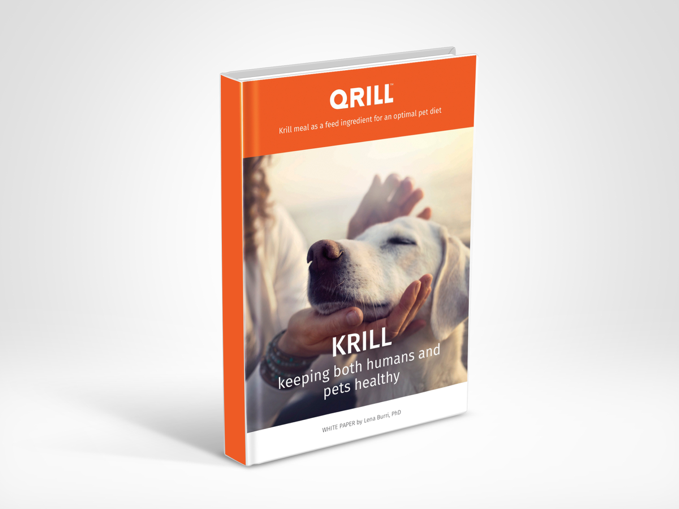 Made from Antarctic Krill, QRILL Pet is rich in omega-3 fatty acids and choline, which are proven to be essential for the healthy development and maintenance of dogs. In addition, while traditional meals, such as fishmeal, deliver omega-3s in triglyceride form, QRILL Pet’s are in phospholipid form. An important difference, since phospholipids are the building blocks of all cell membranes and are the best delivery molecules of omega-3 fatty acids to tissues. A true game changer for pet nutrition, and ultra-endurance sled dog racing it seems, Joar’s partner Mille Porsild says. We are very, very thankful to Aker BioMarine and the QRILL Pet team. Reality is that the support, knowing that you have his back, gave Joar more freedom to make decisions in this race aggressively, going not just for another top-spot, but for victory. Now, Joar cannot wait to see his team in action next season after a whole year of feeding the dogs food with QRILL.